Brighton have done the double over their rivals for the first time in 31 years after carving out a 2-1 victory at Selhurst Park in Saturday's early Premier League kick off. The matcj was a physical and robust contest that produced few clear chances but a lot of derby passion as the Seagulls head home with the bragging rights. Florin Andone suffered a warm-up injury forcing Brighton into a late change, Glenn Murray started in his place and the former Crystal Palace man was at hand to give his side the lead. James Tomkins couldn't deal with the swirling long ball leaving the door open for Murray to finish expertly on the volley. The two sides exchanged heavy challenges with both having a penalty waved away before Crystal Palace were awarded one when Davy Propper lunged at Andros Townsend. Luka Milivojevic has an excellent record from the spot and he didn't disappoint, levelling the scores for the home side. Brighton played deep resulting in few attacking opportunities but they proved clinical again, regaining the lead with just their third shot of the game. Anthony Knockaert produced another moment of brilliance finding space on the edge of the box before launching another curling shot beyond Vicente Guaita. Roy Hodgson will be bitterly disappointed after seeing his side dominate possession and attacking play but produce so little. It was a tale of two opposites with Brighton being punishingly clinical and Crystal Palace wasting chance after chance. For all their build-up play they didn't trouble Matthew Ryan from open play and they always looked vulnerable on the counter. Key attacking players like Wilfried Zaha offered nothing and a flurry of attacking reinforcements from the bench struggled to make an impact either. Blow it every time. Fed up. Crystal Palace were maybe shaken by Brighton's physical approach to the game but the performance was tepid. They didn't take nearly enough risks when it mattered and a few too many when they shouldn't, failing to deal with two fairly simple breaks from the opposition. An impressive run of form meant Palace had only lost one of their last eight in all competitions and moved away from the drop zone. This was a swift reality check that there's still a bit of work to do for Hodgson to get his side over the line to safety and they'll maybe have to shelve those top 10 dreams for another season. STAR MAN - Nobody excelled for Crystal Palace and that was the key difference between the two sides. Townsend showed a great deal of experience and spatial awareness to buy the penalty and get his side back into the game. He draws the challenge from Propper and gladly drifts into it, he's heading away from goal and has few other options on in the area. It's a crafty bit of guile from the winger and that intelligent piece of play sadly proved to be the definitive moment of quality for his side. Derbies are expected to be fierce contests and Brighton were quick to match their fans furore. There were a few over eager challenges, Knockaert's very quick booking could have easily been a red had it come later in the game. ​​They set the standard of the physical contest early on though and challenged the opposition to match them. It disrupted Crystal Palace's game and resulted in a few careless moments. With a little help from the windy conditions, it was enough to give Brighton the lead with their first shot. That same style cost them later on though when Propper's mistimed challenge tripped Townsend to hand the home side a way back into the game. Chris Hughton's side will feel aggrieved as they were denied a clear penalty in the first half when Scott Dann yanked down Shane Duffy at a set piece. Anthony Knockaert's 28 second yellow card is the fastest booking in the Premier League in 10 years! It will likely fuel the ongoing VAR debate as officiating played a controversial role in yet another Premier League fixture. Fortunately for Hughton, a moment of magic meant the decision didn't cost his side the bragging rights and a vital three points in the relegation scrap. 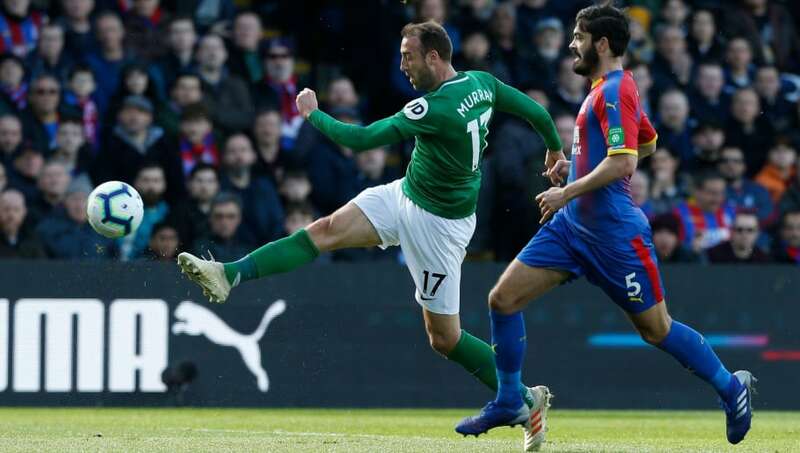 STAR MAN - Glenn Murray rolled back the years to haunt his former club once again, that's four goals in four games against Crystal Palace. The 35-year-old took his first and only chance of the game with a wonderful volley. Gambling on a long ball from Lewis Dunk, Murray made no mistake when the opportunity presented itself, leaving Guaita no chance with his curling effort. It was a typical performance from Murray showing why he remains an important attacking threat for the Seagulls. Crystal Palace face a FA Cup quarter-final tie with Watford up next before another winnable home fixture against bottom side Huddersfield. Brighton have a similar schedule, they face Championship side Millwall in the FA Cup quarter-final before a crucial home tie against Southampton.